Our latest pantry pick- Daphnis & Chloe herbs. We got a chance to chat with the creator, Evangelia Koutsovolou-- an Athens-based herbal enthusiast who supplies us with the best tasting and most beautiful speciality dried spices and herbs we've EVER cooked with! Dive into her biz to explore the terroir of Greece and how she maintains an unwavering passion for learning. "Before Daphnis and Chloe I used to work as a freelance writer and even though in my family we’ve always been quite picky with produce, there’s nothing in my background that could make someone guess this career turn. My previous job has been precious in teaching me how to do research but other than this, when I started Daphnis I was simply 29, naïve, ambitious and eager to do things differently. The fact of having so many friends in creative jobs and my obsession with details both have a strong impact on Daphnis & Chloe. And then the rural heritage of Greece, the good and simple recipes of our tradition have definitely influenced the way we think about ingredients and cooking. Throughout the life of Daphnis & Chloe, we've invested way more energy on ethical rather than on stylistic decisions. The funny thing is that these decisions do influence our brand identity a lot. To give you idea, when a company based in a country with a scarce manufacturing industry decides to create a locally produced packaging solution, the designer’s options narrow down dramatically! 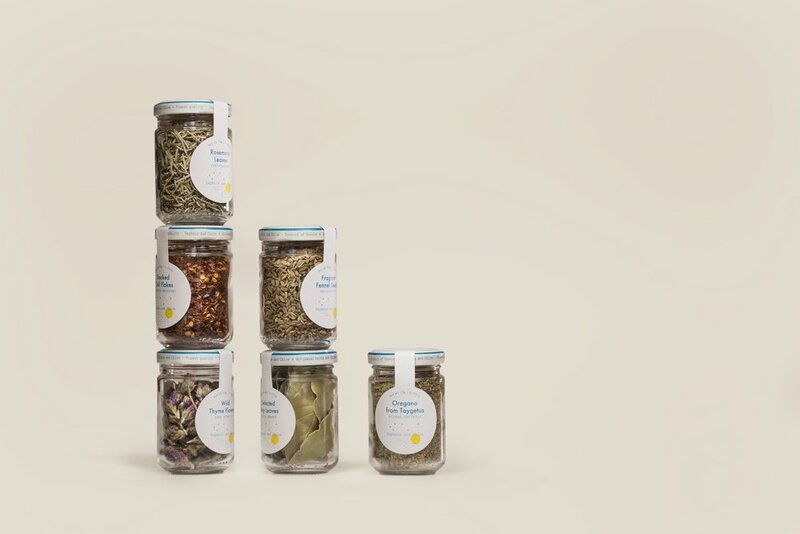 We deal with a unique category of ingredients; our selection goes against the common misconception that dried herbs are an “emergency solution”. Because most people haven’t developed a qualitative standard for, let’s say – oregano, they are caught by surprise when they taste ours for the first time. 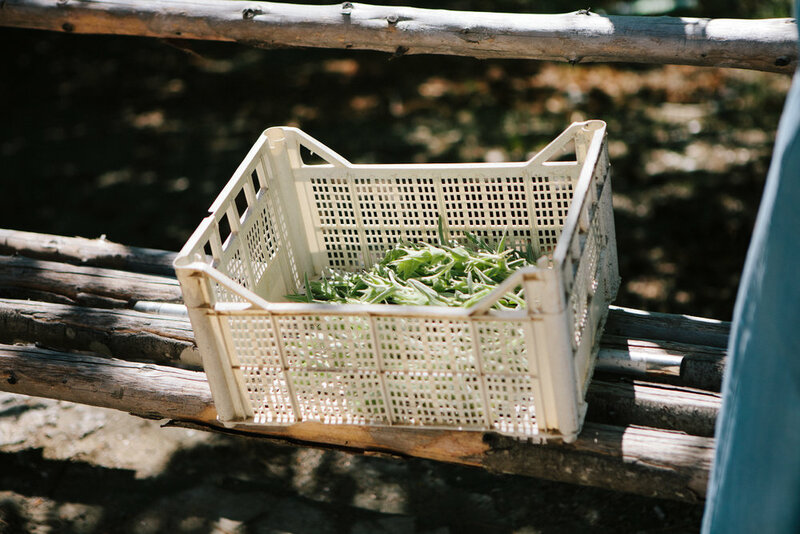 The ”terroir” of Greece is great for the propagation of Mediterranean herbs, and this is why we’re sourcing from Greece. We do pretty much everything in house, so we got the habit of thinking of Design as an ongoing process: My friend Adrianna has been taking our pictures since day 1, Omar has helped a lot with the logo & brand identity, while Natalia and I have designed our website, catalogue and most of packaging together. I love being involved in the design process and over time I’ve assumed the role of pointing out the “practical” aspects of our decisions. For example, recently we got stuck in the design process of the box for our glass jars – I found the solution in a vintage six pack of Belgian crystal wine glasses! The most important quality are the people who run the farms. The varieties & terroir are of course very important, but our herbs couldn’t exist as agricultural products without good farmers to care for the produce. Technical knowledge apart, it takes sensibility to create great ingredients. We have several suppliers and we do field trips every spring. Most farms are located in remote parts of Greece so it often happens to go there with friends or with my boyfriend and transform those visits into weekend escapes. This is actually my favorite part of the job! We source from female farmers! However one thing that I’ve always observed with great interest is that many of the tasks in a farm are gender specific. It’s very interesting to notice how tasks that require a greater attention to details are assigned to and managed by women." We have an overwhelming amount of returning customers, and often receive enthusiastic messages from people who cook with our herbs. I’ll answer this by quoting one of them: “We've been enjoying your beautiful herbs with mostly every meal. We love discovering them more and more. Tonight we are cooking Scottish cockles with bacon and your amazing Thyme Flowers. Simple food that turns exceptional by using a herb as a main seasoning ingredient. Everything about your products shines with joy and every dish transforms into an exquisite meal. Congratulations!"